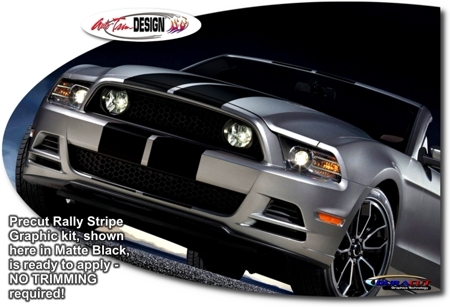 Make your '13-'14 Ford Mustang "Tough-looking" with our "Shelby GT500" Stylized Rally Stripe Graphics kit. Kit pieces are PRECUT and ready to apply in a wide variety of colors - NO TRIMMING required! This stripe package is not just a box of 10" straight strips. Our graphic kit consists of prefitted and contoured pieces as shown in the illustration and within our Part Lists. Stripe width varies from approximately 10.3" (26.16cm) in the Front to approximately 11.3" (28.70cm) in the Rear and set for a center space of 1.5" (38.10mm) - just like the Shelby GT500! Various spoiler and hood configurations are available as options. Trimmable two (2) piece Hood Scoop Kit (ATD-FRDMSTNGGRPH282) consists of two (2) 40" (101.60cm) long precut pieces that can be hand trimmed for most hood scoop applications. Trimmable two (2) piece Spoiler Kit (ATD-FRDMSTNGGRPH289) consists of two (2) 16" (40.64cm) long pieces that can be hand trimmed for most after-market spoiler applications. Note: Price shown is based on a '13-'14 Ford Mustang V6/GT Coupe with no Rear Lid Spoiler. Build a kit to your specific vehicle using the drop-down selection boxes above.